'Letting Go' is the latest chapter in the long running success story of Stockton's Wing, an outfit widely regarded as the Academy of Excellence of Irish music. Many of Ireland's finest musicians have graced the ranks of Stockton's Wing, contributing to an impressive body of work which has consistently pushed back the boundaries of Irish Traditional Music. Letting Go is the seventh studio album from Stockton's Wing in the course of an eventful 22 year career and it's the first to showcase the remarkable talents of singer/songwriter Eamon McElholm from Omagh, Co. Tyrone. Eamon has made an immediate impact, providing no less than six original songs for Letting Go'. The new chemistry at work in Stockton's Wing has produced results that can only be described as sensational. In The words of founder-member Maurice Lennon "Letting Go' is the closest we've come yet to what we originally set out to achieve. We all have a very good feeling about this record." A recipient of the prestigious PRS/John Lennon Songwriters Award, Eamon McElholm replaced Mike Hanrahan in the lineup in July 1984, joining forces with Maurice Lennon, Paul Roche and Davey McNevin. In the words of Maurice again "he brought a new life, a new energy to the group." It's an energy that pulsates through 'letting Go', an album bursting with new material and new ideas. Stockton's Wing have been engaged in the pursuit of excellence ever since their inception in Ennis, Co. Clare back in 1977. Founded by a quartet of All-Ireland champions - Paul Roche, Maurice Lennon, Kieran Hanrahan and Tommy Hayes - together with Tony Callanan, Stockton's Wing combined pristine playing with bold innovation from the very outset. 'Letting Go' - the group's first studio album since 'The Crooked Rose' which won widespread acclaim in 1992 - embodies all the qualities we've come to expect of Stockton's Wing: qualities of breathtaking virtuosity, memorable tune ever present capacity to surprise and trill. As well as their deserved reputation for creating musical fireworks, Stockton's Wing are also famed for such memorable hits as 'Beautiful Affair', 'Walk Away', 'Why Wait Until Tomorrow' and 'Avondale'. Eamon McElholm's song writing skills are immediately evident on 'Letting Go' and 'The Wing's' eight album is choc-a-bloc with compositions that are sure to become established Stockton's Wing classics. Sitting alongside the album's five sparkling instrumentals are a half dozen songs penned by Eamon which demonstrate the breadth of his song writing talent. "Each song has a different theme' he explains. "there's a gospel song, 'I'll Believe again', which contains an Irish influence. I think it might surprise a few people. The single 'Letting Go' is an up-tempo, raggle-taggle acoustic Irish rock song about being under pressure. 'All The Time' is an emigration song played in a modern style. 'Another Day' is a ballad expressing the belief that no one can be condemned for standing up for their civil rights. 'Anyone Out There' questions the existence of a Greater Being in a world plagued by wars and famine. The closing track, 'I Told You Forever', is a love song which introduces a reel towards the end" . Recorded at Windmill Lane Studios, 'Letting Go' was produced by the renowned arranger and composer Shaun Davey and features contributions from former Wing member Steve Cooney (bass) and Noel Eccles on percussion, with Brendan Begley guesting on accordion. The result is an added percussive thrust and what Maurice calls a new found "clarity of Sound', thanks to Shaun Davey's filtering-out production style. 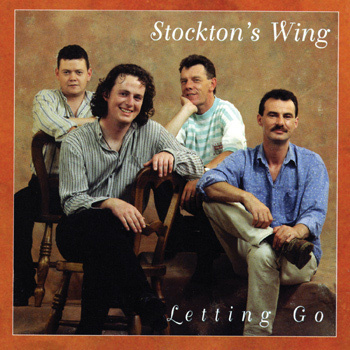 What everyone agrees on is that "Letting Go' is the sound of Stockton's Wing soaring to new heights! "Stockton's Wing seem to have been rejuvenated with the arrival of Eamon McElholm into the fold. He brings a new Joie de vivre to the proceedings. Letting Go sees Stockton's Wing achieving the heights aimed for in the past but never quit reaching. The music breathes with a freshness and a reborn energy. Stockton's Wing have in truth re-invented themselves and Letting Go is proof of their artistic merit being actively achieved." "Letting Go opens a vivid new chapter in the long running sucess story of Stockton's Wing, an outfit widely regarded as the academy Of Excellence of Irish music. Many of Ireland's finest musicians have graced the rank's of Stockton's Wing contributing to an impressive body of work which has consistently pushed back the boundaries of traditional Irish Music"